“If it’s innards I’ll eat it.” There may be something grammatically off in that phrase but it captures my culinary slogan while in France. “Innards” may also be off a bit, since I mean to include feet, ears, and cheeks as well as other unusual edibles. The official English word is “offal.” It signifies whatever is to be discarded when an animal is butchered. Dishes featuring offal, “variety meats” in the accepted euphemism, were prominent in traditional cuisines. They tended to fall into disfavor with prosperity, quick and easy meals, and a desire to leave peasant roots behind. Then came the 2008 economic downturn. According to statistics released by the French National Confederation of Tripe Suppliers (yes, there is such an organization and “tripe” is shorthand for all “variety meats”), consumption of tripe and tripe products was up by 15% last fall. 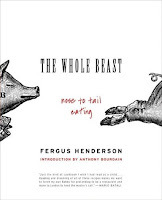 “There’s a real future in offal, right now” is how the director of the Center for Meat Information put it. 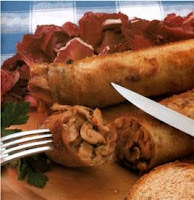 One real challenge and the test of a true offal fan is something called andouillette. It’s essentially a strong-smelling sausage stuffed with bits of chopped pig intestine. In nearby Avignon, there is a small restaurant whose owner spent time in San Diego. She, in a dual language pun, calls her place Épice and Love. The andouillette there was delightful. At least I thought so. Admittedly, it's not to everyone's taste. In a one star restaurant I ordered, as an appetizer, something which even finicky eaters would love (not knowing its source, at least). 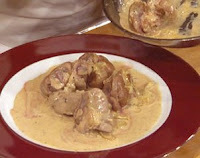 It is ris de veau, “sweetbreads.” This is calf’s thymus. It comes pan-seared to perfection with a light sauce. Cutting into it reveals a smooth, white texture. If andouillette is for the seasoned innard eater, sweetbreads offers an excellent introduction for the novice. In the Riviera town of St. Raphael, one of the daily lunch specials was tripes niçoises. The tripe are cooked in a sauce which includes tomatoes, white wine, garlic and a bouquet garni. Who could resist? Sometimes, the appetizer salad includes innards. In the village where we have been staying, one restaurant’s salads features warm chicken livers. A famous innard dish, which I savored in an Avignon restaurant, is foie gras. This liver preparation is well-liked even by offal avoiders. So much so, that it almost doesn’t really count. Kidneys definitely count, especially served with a Dijon mustard sauce. An Alsatian chef in the village of Cabris perched above Grasse, overlooking the Mediterranean, did the dish proud. With time running out, there are some treats still on my agenda. One is salade de gésiers, featuring slices of warm gizzard as the key ingredient. High on my list is an all time favorite, blood sausage. Because of the Cajun influence, we in the U.S. know it by its French name, boudin. Boudin noir served with applesauce and mashed potatoes represents one classic combination. At the end of the month we will be in Paris and I plan to head for Chez Paul, on rue Buttes-aux-Cailles where this combination is especially well prepared. There is also a restaurant here in the village that serves a Provençal specialty, pieds et paquets. The pieds are indeed feet, those of lambs. The paquets are little “packages” whose main ingredient is tripe. Their shape resembles a sort of small stuffed pepper and they are held together by string. With some luck, I’ll get good boudin and pieds et paquets before flying back to the U.S. I doubt that any restaurant back in Albany New York will feature them on the menu.